It began its life as a museum in 1989 and following major redevelopment, reopened in October 2006. Today, the yellow Ashington brick buildings have protected, listed status. 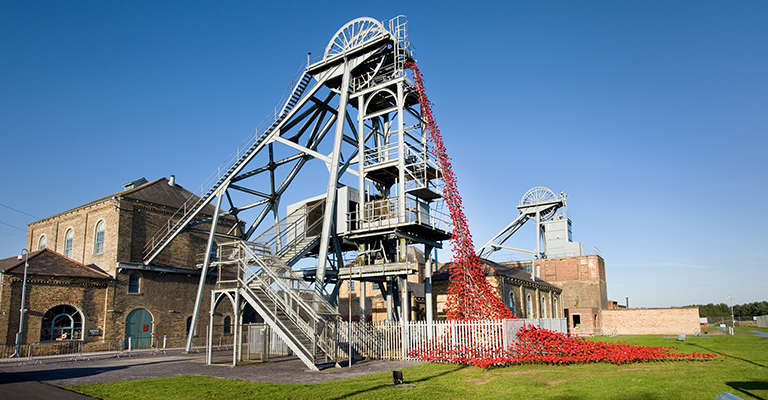 The site is recognised as a Scheduled Ancient Monument and it is the best surviving example of a late 19th/early 20th century colliery in the North East tradition. The new Cutter building is stunning – inspired by monster coal cutting machines, and with the original colliery buildings it tells the story of Northumberland through fascinating, emotive displays, miners’ paintings, an exciting changing exhibition programme, and Northumberland’s amazing archival “treasures”. The Northumberland Archives cover over 800 years of the county’s history and provide an amazing record of the past. The Workshop Galleries hosts our big blockbuster exhibitions and in recents years has welcomed Wallace & Gromit, famous movie cars and even Dinosaurs. Keep an eye out for details of the next event. Woodhorn is a great attraction for the whole family with hands-on activities, an events programme and that all important cup of tea! And don’t forget the country park with its cycle route around the lake.